Draper is a city in Salt Lake and Utah counties in the U.S. state of Utah, located about 20 miles (32 km) south of Salt Lake City along the Wasatch Front. As of the 2010 census, it had a population of 42,274, having grown from 7,143 in 1990. The current population is estimated to be approximately 47,710. The Utah State Prison is located in Draper, near Point of the Mountain, alongside Interstate 15. The execution of Gary Gilmore took place there on January 17, 1977. The Utah Legislature voted to relocate the state prison in Draper in 2014 and approved the Salt Lake City location recommended by the prison relocation commission in August 2015. The Draper Prison will be closing in 2021. The new prison facility in Salt Lake City is slated for completion in late 2020, with inmates moving from the Utah State Prison in Draper in 2021. The city is home of 1-800 Contacts and a large eBay campus. In the fall of 1849, Ebenezer Brown brought cattle to graze along the mountain stream of South Willow Creek. The next spring, Ebenezer moved his wife Phoebe and family to settle in Sivogah, the Indian name for the area which means "Willows." Ebenezer sold his cattle to immigrants heading to the gold fields of California along what became the Mormon Road. More settlers moved to Draper in the next few years. 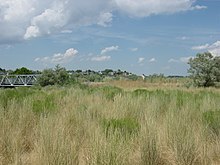 Later the area was called South Willow Creek. By 1852, 20 families lived along the creek. In 1854, the first post office was established with the name Draperville for William Draper III, the first presiding elder of the town's Mormon congregation. The name of the town in later years was shortened to Draper. Hostilities with the Native Americans began in 1854, and a fort was established were the local settlers lived, during the winters of 1855 and 1856. The fort was never completed, as the feared hostilities did not materialize, and its former location is now the site of the Draper Historical Park. In the 1940s, Draper was known as the "Egg Basket of Utah." Eggs produced in Draper were marketed from coast to coast and the co-op furnished eggs for the military troops in the South Pacific during WWII. The poultry business was the single most important economic industry in Draper during this time. One large poultry farm was the Washburn Poultry Farm run by Bruce D. Washburn with over 10,000 chickens during the 1950's. Draper remained a small farming community until the late 1990's, when its population began growing exponentially from 7,257 in 1990 to an estimated 47,710 in 2018. Draper was incorporated as a city in 1978. Draper City is nestled in the far southeast corner of the Salt Lake Valley, with the Wasatch Mountain Range on the East and the Traverse Ridge Mountain on the south. At the Point of the Mountain, Draper is known for one of the most popular and best wind areas in the country for hang gliding and paragliding. According to the United States Census Bureau, the city has a total area of 30.1 square miles (78.0 km2), of which 30.1 square miles (77.9 km2) is land and 0.015 square miles (0.04 km2), or 0.05%, is water. Draper's climate is roughly identical to that of other Salt Lake City suburbs. However, due to being further away from the Great Salt Lake, varied elevation, and from the downtown urban heat island effect, Draper experiences a slightly drier winter, and more extremes in temperatures. The average temperatures in winter and summer respectively are 30 °F to 50 °F, and 80 °F to 100 °F. Springs are usually mild and wet, while fall can sometimes become an Indian summer with drier weather. Monsoonal moisture from the south usually brings afternoon thunderstorms in July and August. Draper falls on the border of the humid continental/subtropical climatic zones, and is technically a cool/warm semi-arid desert environment, but with summer monsoonal moisture. Snow usually falls regularly from November through March. The headquarters of 1-800 Contacts in Draper, Utah. 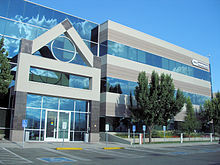 Draper is home to the tech call center of PGP Corporation, the call center of Musician's Friend, and the headquarters of 1-800 Contacts, Control4, and HealthEquity. Draper is also home to Utah's first IKEA, which opened in 2007. 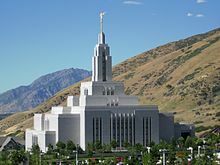 The Church of Jesus Christ of Latter-day Saints constructed a temple in Draper that was dedicated on March 20, 2009. The Draper City Journal, a tabloid style newspaper covering local government, schools, sports, and features. Delivered to homes directly monthly by mail. The Draper Families Magazine, published monthly, features special interest stories about the people who make Draper City their home. Draper City publishes a bi-monthly city newsletter entitled "The Draper Forward." This publication is mailed to all of the residents in Draper City. Draper is part of the Salt Lake City DMA and is covered by KSL, FOX13, KUTV, KTVX. ^ "City of Draper, Utah Annual Report to our Citizens 2011-2012". Draper City, Utah. Retrieved August 9, 2014. ^ "Profile of General Population and Housing Characteristics: 2010 Demographic Profile Data (DP-1): Draper city, Utah". U.S. Census Bureau, American Factfinder. Archived from the original on September 11, 2013. Retrieved March 7, 2012. ^ "Geographic Identifiers: 2010 Demographic Profile Data (G001): Draper city, Utah". U.S. Census Bureau, American Factfinder. Archived from the original on September 11, 2013. Retrieved March 7, 2012. Wikimedia Commons has media related to Draper, Utah. Wikivoyage has a travel guide for Draper, Utah. This page was last edited on 11 April 2019, at 01:30 (UTC).